Thinking to buy a Portable Pool Basketball Hoop for your swimming pool? then this guide is gonna to provide you useful information in this regard. Choosing a good Best Pool Basketball Hoop is never easy, especially when you have so much of them out there. You will have to look for many factors in each hoop before buying. 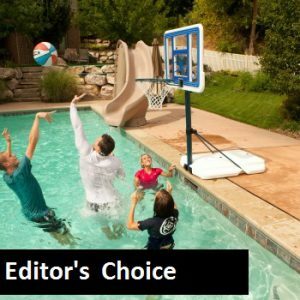 So, we thought to write a guide for you people which help you in selecting a good and Affordable Pool Basketball Hoop. This Guide is created after a deep research on each of them individually, and after comparing their features, reviews, and prices here we are with our top 10 best Pool basketball Hoops. Lifetime 1306 is one of the best and top rated Basketball Hoop For The Pool. Lifetime 1306 includes a huge 44-inch High-Density Polyethylene backboard with height adjustment feature within a range of 4.1 – 7 feet. Lifetime 1306 is portable and includes a 27 Gallon Base. The backboard of the hoop is tough and hard made from high-density Polyethylene. The 44 inches Shatterproof Fusion backboard is virtually unbreakable because of its tough material. The backboard of the hoop is all weather resistant and can withstand extreme conditions. It includes Graphics for the target point which will help you in advancing your skills. The overall design and look of the backboard are beautiful. The hoop comes in 2 pieces, 3-inch telescoping pole which can be adjusted from 4.1 to 7 feet. Assembling the pieces of the pole are really easy and do not require any extra energy. It can be easily assembled with one hand. Lifetime 1306 Pool Side Basketball hoop comes with a 27 Gallon Portable Base which provides stability and portability to hoop. The base can be filled with tap water or sand. It is made of good quality plastic and no repots were recorded reagarding leackage on amazon. Lifetime 1306 comes with 5 year limited manufacturing warranty. Looking To Buy a long Lasting Basketball For your hoop? Check out Our Top 10 Best Outdoor Basketball and select the best choice for your basketball game. 27 Gallon Portable Basketball Base which can be filled with water or sand. Swimline 9162 is one of the Best In-Pool Floating Basketball Hoop which is available in resonable price. Swimline 9162 icnludes PVC fluted tubing for maximum strength and duratiblity. Swimline Super Hoop also include heavy duty net and a real feel basketball. Swimline is a good choice if you are looking for a best pool basketball hoop at the affordable price. It can be used by children as well as adults for playing the game in the pool. It is easily portable that’s why we have ranked it at second number because people usually love to play basketball in pool or sea using this hoop. Swimline weights only 2.6 pounds so it is very easy to lift. Swimline includes Free shipping and can be shipped even outside the US (in selected countries). Buy a pack of 2 now and get 26% Discount with free shipping. High-Quality in-pool Floating Basketball hoop. Dunnrite Splash is a great Basketball Hoop For Pool. It includes a 43 Inch x 28.5 Inch Polyurethane Backboard with height adjustment up to 56 inches in infinite increments. It also includes 25 Gallon Portable basketball base which provides stability and portability to the hoop. With Vinyl-coated steel rim and all-weather net. Dunnrite includes a super-tough 25 Gallon Polyethylene basketball hoop base which is 40W x 24L x 10H. It can hold 25 Gallon water or sand and weighs 200 lbs when filling with water. The base of the hoop is really tough and hard and can sustain extreme conditions. Being made of Polyethylene, there is no chance of leakage from the base. It includes telescoping pole which can adjust the height up to 56 inches above the swimming pool deck in infinite increments. The pole has a one piece 2 3/8 Inch round heavy duty and is coated with Aluminum Powder which makes it resistive free. Dunnrite Splash and Shoot Swimming include a 43 Inch x 28.5 Inch Polyurethane backboard which is really tough and can withstand harsh conditions. The backboard is provided with graphics for the target point. the backboard of the hoop has a unique design. The vinyl-coated steel rim is rust resistive and hard to provide extra bouncy action. Rim is also provided with all weather net. Height Adjustment upto 56 inches. No Warranty Present in Amazon. However, manufacturing material is good and this one is highly recommended if you can afford it. Dunnrite Pool Basketball Hoop is another great choice for you if you are thinking to setup your swimming pool basketball system. 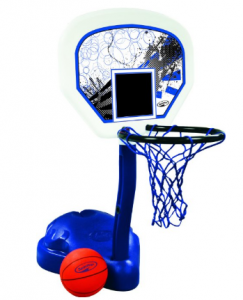 It includes 31 Inch x 22 Inch Polyurethane backboard and Viny coated 14 inches steel rim with all weather net. 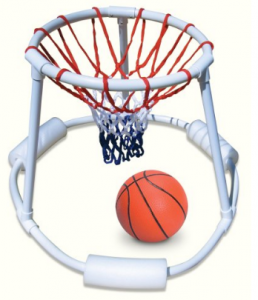 Dunnrite basketball hoop for pool includes 17 inches wide x 19 inches deep x 38 Inches tall portable base. Height of the hoop is 36 inches “fixed” that cannot be adjustable and the whole system weights 115 lbs. Dunnrite PoolSport Swimming Pool Basketball hoop is a huge portable basketball system that can be used in pools for playing basketball ball. It can be easily placed on any solid surface near the pool. Dunnrite is 36 inches high above the desk basketball hoop which includes a hard 31 x 22-inch Polyurethane Basketball Backboard. The backboard of the hoop is hard and tough and can withstand hard conditions. Backboard also includes graphics which can help you in advancing your skills. Dendrite also includes a 17 inches wide 19 inches deep and 38 inches high portable base which provides stability and portability to the hoop. The base of the hoop is made of good quality plastic. 14-inch steel rim Vinyl coated which make it resistive to rust. Rim is provided with white all weather net. Dendrite includes free shipping within a week. The overall weight of the hoop system is 115 lbs while shipping weight is about 24.3 pounds. Sklz pro Mini Pool Basketball Hoop is another great Pool Basketball Hoop which is easy to lift and include multiple features. It can also be used as in-door basketball hoop becasue of its height adjustment feature and portable base. SKLZ Pro mini includes shatterproof backboard with graphics. The backboard is hard and tough made of Polycarbonate. SKLZ Pro mini also include heaight adjustmen feature for pool or driveway with pool side friendly mobile base. 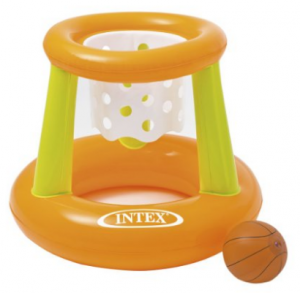 You will also receive mini basketball with this hoop system. SKLZ Pro includes Polycarbonate shatterproof backboard sizes 33×23 inches. The backboard is tough and hard and can withstand tough condition. The backboard of the hoop includes blue graphics which highlight the target point. Rim of the hoop is a Heavy-duty steel 14.5″ rim with painted with blue color which makes it resistive to rust. Pool Basketball Hoops must need to be resistive to rust because they are used in water and there is a greater chance of rusting in the pool. SKLZ Pro include this feature and both the Rim and Pole are resistive to rust. Rim is also provided with all-weather net. 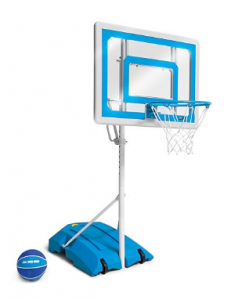 SKLZ Pro Mini Basketball Hoop for pool includes height adjustment feature. Now adjust rim height from 3.5 to 7 feet. It also includes poolside friendly portable base which is made of good quality plastic. One of the special features of SKLZ Pro is that it can be used for both indoor and poolside games. Because of the height adjustment feature and resistant to rust the hoop can be in both places. SKLZ Pro includes height adjustment feature from 3.5 to 7 feet which are a great range. Secondly, the base of the hoop is Portable and poolside friendly with a special design. This feature makes it enable adjust on different surfaces easily. Adjust Height From 3.5 to 7 feet. 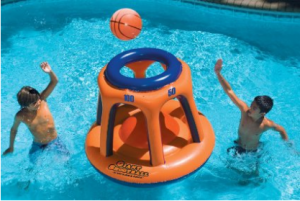 SwimWays is a heavy duty swimming pool basketball set that’s fun for the whole life. It is heavy duty extra large basketball backboard. SwimWays also include a built-in ball rest with the portable base. Swimways is easy to assemble and requires no tool for its installations. It is easy to carry because of its small size. The material of the hoop is made of quality and therefore, it can sustain harsh conditions. SwimWays includes extra large durable backboard with amazing graphics and black steel rim. The backboard and rim are coated with graphics material which makes it resistive to rust. The Rim is provided with all weather net. SwimWays includes a short blue pole without any height adjustment feature. It is made of good quality plastic. The pole is resistive to rust. Installation or Assembling of the Basketball system is easy and do not require any tools. It also includes a sturdy base with built-in basketball rest. 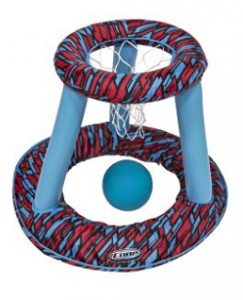 The base is portable and the built-in basketball rest increase the stability of the hoop. SwinWays comes with a free pro-style basketball. 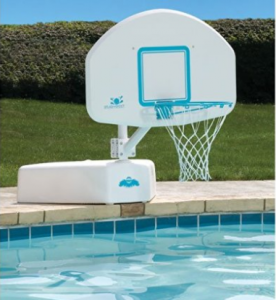 Lifetime 1301 is another great pool side basketabll hoop from lifetime. 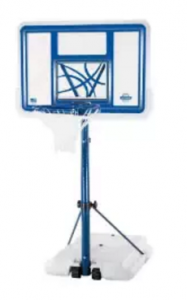 Lifetime 1301 comes with a huge 44″ impact polyethylene backboard and with height adjustment feature from 4 to 6.5 feet. The range of height adjustment makes the hoop usable for both in-door and poolside basketball games. It includes High Density Polyethylene backboard which makes it virtually unbreakable. heavy-duty portable base that can be filled with water or sand. Lifetime 1301 includes High-Density Polyethylene 44 inch backboard with graphics. The backboard is hard and tough and can sustain extreme conditions. The 44-inch rectangular backboard is resistive to rust. It includes telescoping height adjustment feature from 4 to 6.5 feet. 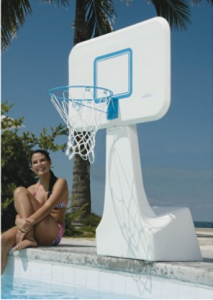 The height adjustment feature enables the hoop to be used as an indoor basketball hoop and poolside basketball hoop. With Blue hammerstone classic rim with all-weather nylon net. The base of the Hoop is portable and can be filled with water or sand. Hot or freezing water can damage the base. Lifetime 1301 comes with free shipping and 23% discount. Height Adjustment From 4 to 6.5. 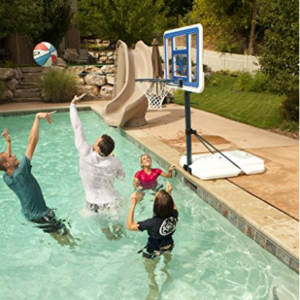 Intex Floting Basketball hoops is a perfect choice for kids under 10 even adults can use it for pool basketball ball. However, it is specially design for kids. It is made of durable 10-gauge vinyl on hoop. Which include Includes inflatable ball and repair patch. Base is portable and can be filled with water which provides it stability. Dimensions of the product are as following: 26.5L x 21.5H inches. Intex floating basketball hoop is made of good quality material and people love to use it during summer games. It is fun to take index floating hoop to the beach. Not For adults and big games. Swimways is a hydro spring basketball hoop for swimming pool with includes textured grip. Swimways has fabric coating which gives it a cool pattern and durability. It also include Sewn-in spring at the base which increase the stability of the hoop in water. SwimWays Hydro is a really nice looking basketball hoop for the pool which is easy to carry. It can be used by kids especially in summer. it includes Sewn-in spring at the base which gives it extra stability in water. 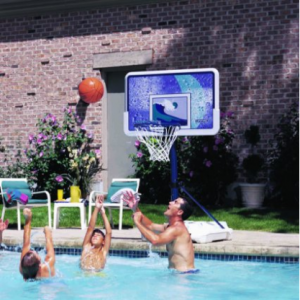 Swimline Giant is a 45-inch tall by 36-inch wide mini basketball hoop for pool. Swimline includes Multi ports for multiple shooters. It comes with 1 free basketball.